The Sep 1939 Register shows John and spouse at Barrow Green Court , Godstone, Surrey, England He is a stockbroker (and ARP, Red Cross in coming war) . The 1881 census records him, four months old living at the family home at 30 Norfolk Crescent, Paddington, London, with his parents Joseph W[atson] [b.1840 London] and Ada Dorothy nee Brown [b.1853 Woolwich, London], and his older sisters Winifride D [b.1876 Paddington], Olive Margaret [b.1877 Paddington], Edith Barbara [b.1878 Paddington] along with five servants. His father’s occupation is given as Stock Broker. The 1891 census records the whole family as visitors at a guesthouse in Seeeton, Devon. The 1901 census records the family [minus the eldest daughter] living at 5 Cambridge Square, Paddington [only a few meters away from the previous home at Norfolk Crescent]. John’s occupation is not recorded. The 1911 census records him living at 25a Norfolk Crescent with his wife Agnes Constance Mary nee Wilson [b.1890 London] whom he married in February 1910, at St George’s, Hanover Square, London. His occupation is given as Stock Broker. He was the second cousin of Samuel Morrow Palmer, famous watercolour artist. Died in the last quarter of 1952, London. 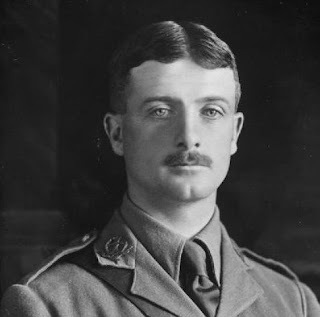 John Giles Overbury was commissioned into the Territorial Force as a Second Lieutenant in the 10th Battalion (Duke of Cambridge's Own) Middlesex Regiment on 1st March 1909. [LG 28236 dated 26 Mar 1909]. Lieutenant J G Overbury MIDDLESEX was promoted to Captain on 15th August 1912. [LG 28645 dated 17 Sep 1912]. 10th Battalion Middlesex Regiment mobilised for wartime service at Sheerness in August 1914. On 30th October 1914 the Battalion, having entrained for overseas service at Sittingbourne, sailed from Southampton for India, arriving in Bombay on 2nd December. 1/10th Middlesex remained in India throughout the 1914-18 war. The artist's cousin, James Giles, given in 1874 as a wedding present to Joseph Watson Overbury and by descent to his son John Giles Overbury. Mrs. A. C. Overbury by 1959, by whom sold through Agnew's to her nephew John Giles Pilcher, Horsham, Surrey, by 1961, and to his widow Nancy Pilcher (d. 1987). with Agnew's, London, from whom purchased by the present owner in 1992.